Shawn Hennigan started working with Friesians in 1989 with four young horses sent in for training. At that time there were only a handful of Friesians in the Northeast. purchased Marinus and Moike. They were the beginning of a new journey based on beautiful black horses. The family was enchanted with the breed, and transformed into true believers that Friesians were the one and only horse to have. 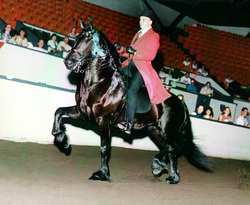 Shawn and the Kent family were educators about the breed through exhibitions and shows. Shawn, Julie, and Marybeth showed Moike & Marinus riding and driving across New England and beyond. People used to ask us, "are those Percherons?" There were only 400 members of the Friesian Horse Association of America at that time, which were kept on index cards in a shoebox! Now FHANA has an office in Kentucky with over 9,000 horses registered. different disciplines, including driving, dressage, saddleseat, and pleasure. horses are loved and well taken care of. to all these horses, and it is always hard to see them leave. Moike and Julie showing in Ladies Pleasure. Moike is now 26 years old, and living the life. 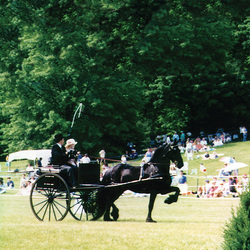 Marinus was the first friesian for Shawn and the Kent family. Copyright Hennigan Friesians, Inc. 2000-2018. No part of this site may be used without written consent of Hennigan Friesians, Inc.